The scope of this project is so enormous that sometimes I can only proceed in what feels like a very small spiraling motion outward. There are so many students and so many primary source documents, as well as the entire weight of Chinese and US History, that I sometimes feel like I am looking into an immense and densely populated forest, with no idea where the best point of entry is. Often it is just easier to pick a place to start, and then research the other people and places that relate to that starting point, until I am finally deep in the research. So: my previous student post was on E. J. Chu, and this post will be on the fellow student he boarded with in Albany: W. K. Lam. 林雲陔 (Jyutping [Cantonese] pronunciation Lam4 Wan4goi1) was born on 4 January 1887 in Canton (today Guangzhou), China. I chose to highlight the Cantonese pronunciation of his name since there is no question in my mind that he was exclusively a Cantonese speaker and went by his Cantonese name. I know this because the romanization of his name in America was “Wankoi Lam”, and there is no way you can get that from the Mandarin pinyin pronunciation of his name: Lín Yúngāi. LIke E. J. Chu, he attended Canton Christian College, although he was probably there at an earlier time; W. K. Lam also had military training in China, which probably happened after his schooling. Chinese Wikipedia, however, states that he graduated in 1912 (Wikipedia, original text: “1912年（民国元年），他从方言学堂毕业，参加高州起义，起义成功後，任高雷都督”). According to the Chinese Students’ Alliance Directories, he came to the US in 1912 on a Guangdong provincial scholarship; I haven’t been able to find any entry information yet. There is a possible reference to him being in America as early February of 1913. The Chinese Student Association Monthly publication of February 10, 1913 states that a W. K. Lam had just left Cushing Academy in Massachusetts (Chinese Students’ Monthly, 10 Feb 1913). However, there’s no indication that W. K. Lam came to America as anything other than a university student, and Cushing Academy was a preparatory high school. The first definitive reference to the W. K. Lam we are looking for is a reference to three Chinese students at the University of Vermont in November of 1913. Two of the students were brought to the University of Vermont by fellow student H. T. Wong (Boston Evening Transcript, 1 Nov 1913). W. K. Lam isn’t mentioned by name, but as there were only three Chinese students at UVM in 1913, one of the two unnamed students referenced in the article must have been him. W. K. Lam is mentioned by name for the first time in the 1913 Catalogue of the University of Vermont as a member of the class of 1917, in other words, a freshman. He lived in room 26 of North Converse Hall and was a general studies student (Catalogue, 1913). His entry in the 1914 Chinese Students’ Alliance Directory states that he lived at North Converse Hall and came to America on a Provincial Scholarship. Both W. K. Lam and H. T. Wong appeared together in a newspaper article again in 1914, this time concerning the death of a local Chinese man in St. Albans, Vermont; neither student was involved in the death, but as they were living in Burlington and could speak Chinese, they served as translators and funeral arrangers for the deceased man (Middlebury Register, 14 February 1914). W. K. Lam is categorized again as a freshman in the 1915 University of Vermont Yearbook; I’m not sure what happened there, but many Chinese students came to America unprepared for a Western-style university education and had to either retake classes or enter a lower level of schooling. Some students, having already completed a college education in China, entered as undergraduate freshman students again at American universities, and some 18- and 19-year-olds began their American university studies with a year or so in private high schools. All this to say that W. K. Lam’s repetition of his freshman year coursework was not out of the norm for Chinese students of the time. He was still a general studies student in 1915, but by this time he was living off campus on 151 Loomis Street. The 1915 Directory entry is, once again, identical to the 1914 information. In the fall of 1915, W. K. Lam entered Albany Law School and lived with E. J. Chu, where they both show up in the 1915 New York Census. I think I made a slight error in the previous entry on E. J. Chu by stating that their lodgings were owned by “an American couple”; this is incorrect. I went back and looked at the Census more closely and the house on 81 Livingston Street was owned by a widowed mother and her daughter. My mistake was in misreading the daughter’s name as Francis instead of Frances, and skipping over their genders and ages. Anyway, W. K. Lam attended Albany Law School for two years, and then transferred schools one last time. In 1917 he moved to Syracuse University and was there for two years. His World War I draft registration places him at 716 Irving Avenue in Syracuse, Interestingly, he is the only one out of those I have researched so far to claim exemption from the draft on the basis of being an alien resident of the United States. When the 1918 CSA Directory came out he was still at Syracuse University, listed at 441 Sims Hall. He was active in the Cosmopolitan Club at Syracuse University, speaking at a meeting on April 5, 1918 (link). This is the last American source document I have on him, although his name does show up again in the 1920 Syracuse Yearbook, as a student member of the Cosmopolitan Club. However, this 1920 yearbook inclusion is in error, as W. K. Lam returned to China after graduation in 1918. 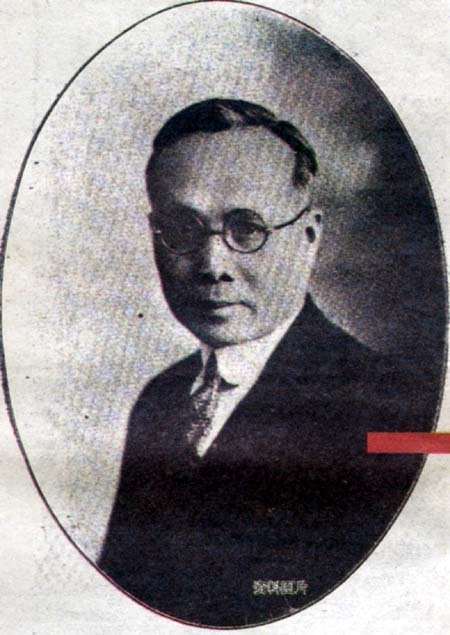 He took up government positions for the new Republic, including filling in as mayor of Guangzhou in 1923, 1927, and 1928-1931 (Albany Chinese School, 2015; original text: “1918年回国后，曾在民国政府的各级政府就职，还担任过广州市长”; years cited at Wikipedia). A quick look at his choppy mayoral tenure gives the impression that the times he served as mayor were based on when Sun Fo, the son of Sun Yat-Sen, was and was not in power; this gives the erroneous impression that W. K. Lam and the Nationalist government didn’t get along. However, it’s more likely that W. K. Lam was someone that could be counted on to keep things running smoothly even if his political superiors were not in power. Indeed, it seems that W. K. Lam held Sun Yat-Sen in high esteem, because in 1927 during his mayoral tenure he founded the Guangzhou Library and named it the “Zhongshan Municipal Library”; 中山 (pinyin zhōngshān) being one of Sun Yat-Sen’s nicknames (Guangzhou Library; original text: “1927年，广州市长林云陔为纪念孙中山，促进文化事业，提议举办市立中山图书馆”). Chinese Wikipedia lists a whole litany of governmental positions that W. K. Lam held in the Republic of China; he seemed to be able to thread the needle very carefully during the turbulent warlord period in Guangdong, remaining effective and in power for quite some time. The previously-cited Albany Chinese School Newsletter limits their discussion of his positions to the most important changes in position, such as his mayorship of Guangzhou and his “promotion” to Auditor-General in 1936 (Albany Chinese School, 2015; original text: “1936年任国民政府审计部长、审计长”). I say “promotion” in quotation marks because Chinese Wikipedia seems to suggest that this was actually a demotion due to his participation on the losing side of an inter-party political war. He was actually first named to the “Mongolian and Tibetan Affairs Commission” before serving in the Ministry of Audits (Wikipedia, original text: “林雲陔离任广東省政府主席，與黃慕松官職對調，转任蒙藏委員会委員長。翌月，改任審計部部長”). This was the position that he would hold for the rest of his life. W. K. Lam died in Nanjing on 4 October 1948 predeceasing the mainland Republic of China by almost exactly one year (Albany Chinese School, 2015; original text: “1948年10月4日，在南京病逝”).